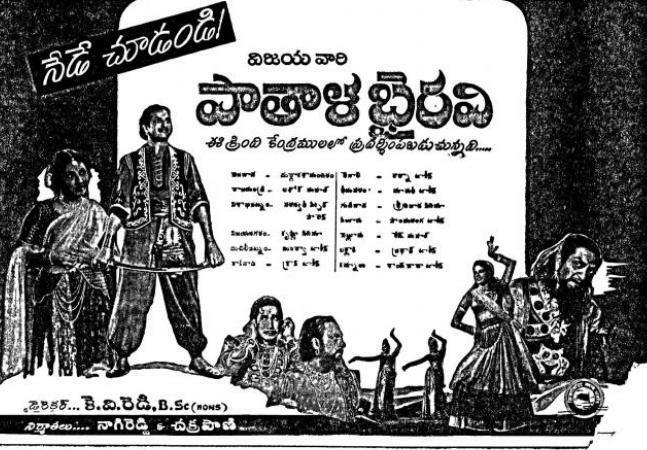 Here is the release day advertisement of Legend NTR's Pathala Bhairavi way back in 1951 in Andhra Pathrika Newspaper. The film is a classic in the history of Telugu cinema. It has the record of being played some where or other in Andhra Pradesh in the first 30 years of its release. There used to be a big demand for this movie print in those days. Pathala Bhairavi is also the first Telugu movie to complete 50 days in the second release. It released in Durga Kalamandhir theater in Vijayawada in 1951 and 2 years later it released in the same theater and ran for 9 weeks. This is a record even today. satya is a keen observer of human behaviour and a devout Tina Fey worshipper. He is a good listener and will gladly listen to all your rants and raves. This job has made him shift base from the far-flung suburbs to town, and He is therefore now adapting to a new lifestyle (which is a sweet coincidence as she manages the lifestyle section at IndiaHeraldGroup) He is a TV fanatic and has watched most of your TV shows well in advance. satya’s favourite shows include ‘Mad Men’, ‘Dexter’, ‘Game of Thrones’ and everything between. His newfound passion is running and thinks that a good 30-minute-run is the ultimate key to happiness. Also, loves the sound ‘hmm’ a lot..